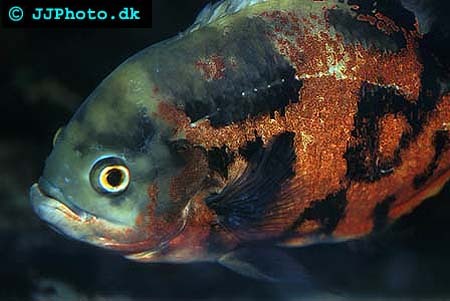 The Oscars, or Astronotus ocellatus, from Cichlidae family, are fairly easy fish to breed. All you need is pretty much leaving them alone and letting them do their thing if you lucky enough to get a pair. If not, breeding might be very hard. They are a very long-lived fish, probably one of the reasons they are so popular today. Originally from Amazon. Oscar Fish obviously requires a large tank due to their large size. They prefer clean and clear water with a deep sand bottom, and a few large rocks. If you keep plants with you Oscars they will be dug up however there are some people that believe that Oscars like to have plants that they can dig up in the aquarium and this might be true since many large cichlid like to have toys when kept in aquariums not to get bored. And since Oscars are large and very smart cichlids, you can actually teach them tricks, they might want something to do like digging up plant. Be careful, they are enthusiastic eaters and they love to eat smaller fish. Thus, only keep them with other fish that are of the same size. Temperature is important, and should be kept stable somewhere in 79-86°F range. Feeding Oscars is not a problem since they will take every food you give, including flake frozen fish, prawns, pellets, earth worms, crickets, kitchen scrapes…and of course live food. The most trying task to do is finding a mating pair. If your Oscar is adult in size, it becomes a really trial-and-error process. However once they form pairs they will stay together for the rest of their life. Probably the most common and effective method of finding pair of Oscars is to buy 6 or 8 young specimens (about 1 inch in length), and allowing them to grow up together. A mating pair can be identified from their mating play, which is a seemingly aggressive behavior towards each other; lip-locking, tail-slapping…. If one of the fish is overly aggressive, and it is a one-sided aggression and you should separate them or risk loosing one of them. During their spawning process, they will use their mouths to clean a flat rock, and the female will lay her eggs there. Not all the eggs are laid at once; the female will take breathers, at which time the male moves in and fertilizes the eggs. A female usually lays 1,000-2,000 eggs. The eggs are opaque at first, turning transparent in 24 hours. After the eggs are laid, both parents watch over the eggs, wafting the eggs with their fin and guarding them against predators. Occasionally they take the eggs in their mouth, which keeps them clean and turns up bad eggs, which are then destroyed. If a constant tank temperature is maintained, the eggs should hatch in about 36 hours. At first, the fry cannot swim, but they squirm "en masse" on the rock, living off the egg sac, for about 4 days. The parents constantly attend to their young at this time. Feeding these fry is easier than other breeds, because of the baby Oscar's relatively large size. A good and simple plan is to crush regular processed flake food in your fingers, and just drop it in. Turn off filtration during fry feeding time to make it easier for them to find their bits of food. How the parents act towards their fry depends entirely on each fish personality. Some have numerous spawn and never bother their fry; others easily eat their young. To be on the safe side, you can separate the fry from their parents. However I do not recommend this until the parents have had a few unsuccessful spawnings. The fry will reach 1.5 to 2 inches after 12 weeks at which time they can be sold.